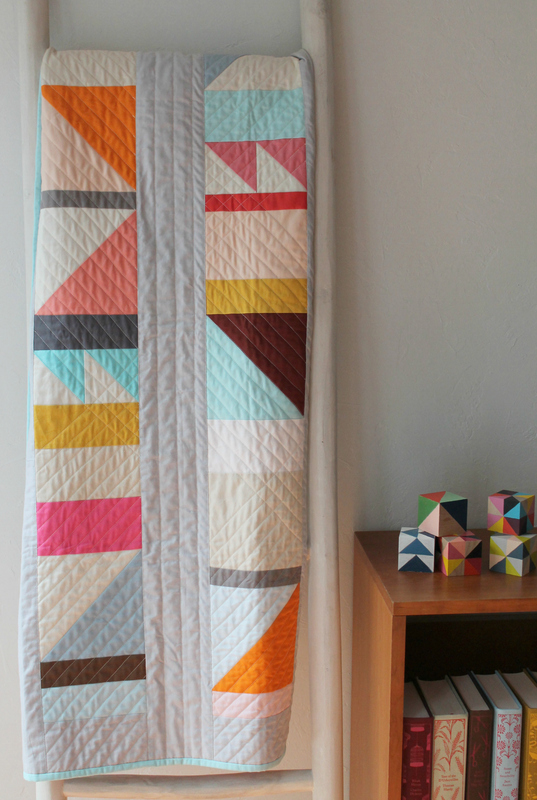 This baby quilt was inspired by the the beautiful geometric paintings of the Australian artist Esther Stewart. Her palette is so inspiring. I particularly like how she combines pastels and earthy tones with touches of bright color. I played around with some different layouts based on some her paintings and ended up with three columns that pick up her motifs of triangles and bars of solid colors. I had so much fun playing around with the balance of pastels, brights, and neutrals. I originally had a dark blue background but my daughter persuaded me to go with gray. The gray doesn’t compete with the piecing in the way the blue did, and I’m so happy with the result. That kid has a good eye for color! I straight-line quilted using my walking foot, using the diagonals in the piecing as my guide. I really like the places where the diagonal lines intersect. My quilting was a little more dense than my usual pattern, but the finished quilt is still really soft and lofty. I have added this quilt to my Etsy shop! 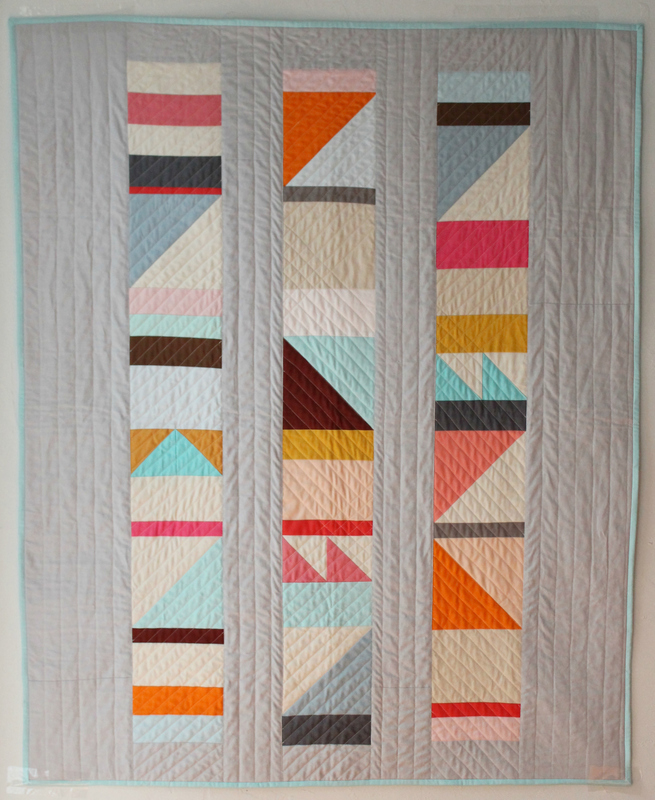 This entry was posted in inspiration, quilts and tagged baby quilt, color palette, Esther Stewart, geometric quilt, modern geometric quilt', modern pastels, wall quilt on January 23, 2015 by brigitdermott. Your quilt is truley beautifyul. going with the grey background was SO THE RIGHT THING to do!!! It is gorgeous! This quilt is so soft and calm. Absolutely beautiful! Congratulations. The palette is perfect! So beautiful, Brig. 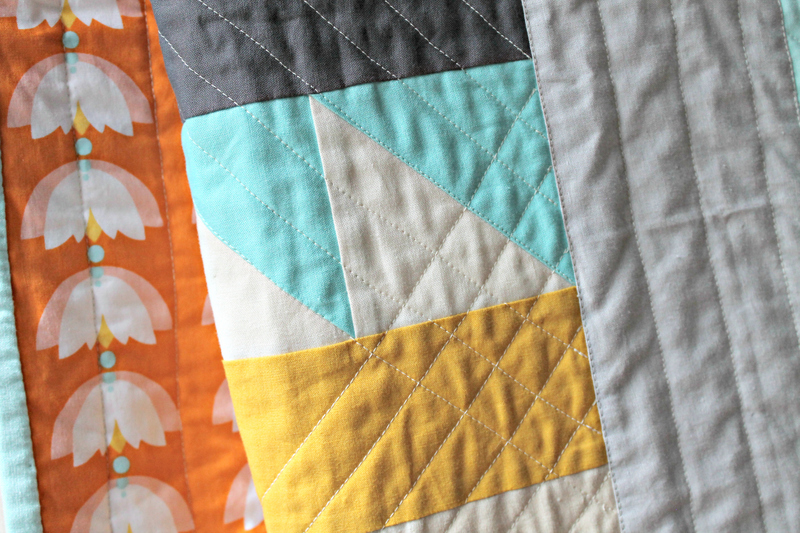 Each quilt is more beautiful than the last, but they all have a signature Brigitgail look!